She loved them so much, she asked me to make more for her class treat yesterday on her actual birthday! To bake you have really two good options - I used the picture method for her party. Cover a baking dish with two layers of aluminum foil. Cut an X in the foil where you'll be placing the cones and push them through. For her class treat, because I had to make so many, I simply stood the cones up in my cupcake pans and cooked them that way (you just have to be careful they don't tip over). Fill the cones 3/4 full and bake for about 20 minutes. When done, let cool COMPLETELY. Then begin to ice. I first did a thin, flat layer on them to make sure all the edge were covered. I then piped additional icing to give it a swirled, ice cream effect. They were a HUGE hit - the kids all asked to make sure because they wanted to keep the picks! lol, so cute. 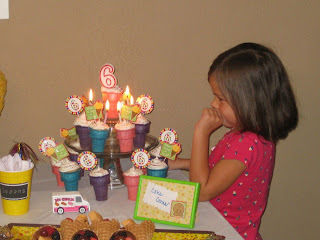 great ideas on cupcake cones!! doing this for my daughter this weekend. having a music themed party and making microphone cupcake cones. can't wait. found the same colored cones (her colors are blue and purple)!! needed some ideas to display them...THANKS!